An audience response system is a powerful and dynamic tool that can be used to greatly increase learning as well as quickly collect data. From large scale events to learning summits, the system was designed to increase participation through live Q&A sessions and fun review games, sparking discussion while easing data collection. It is my goal to provide you with a few how-tos that will help you get the most out of your response system at your next conference or event. Double-Check Your Work and Get to Know the Software. Before launching a presentation be sure to double check that you have correctly tagged all of your slides. It never hurts to double-check your work. Additionally, spend a little time practicing and using the software prior to your event. Connectivity Tips that will Enhance System Performance. Here are a couple recommendations for more smoothly connecting to the host. First, it is always best practice to place the host in a centralized location. The range of the host is 100 meters, so if this is not possible, generally placing it to one side of the conference hall or another will also work. Second, use a mic stand and USB extension cable to raise the host above the crowd. This allows the signal to travel more quickly through the room. Also keep in mind that the host should not be put behind a wall or screen. It is always best to have a clear, unobstructed path between the host and voting devices. Lastly, to help prevent interference, turn on other companies’ PowerPoint Clickers (small hand-held devices that advance the slides), before turning on the Qwizdom Audience Response System. Our system follows FCC regulations and standards when locating an open port. Some PPT clickers do not follow these regulations and simply go to the first port and ignore other systems or wireless controls. Our system is designed to go to the first available port, so you can completely avoid interference by first turning on the PPT clicker. Give Your Audience a Brief Tutorial Before Balloting Begins. Before starting a voting session it is a good idea to warm up your audience with a simple how-to tutorial. Walk your audience through the basics of turning the device on/off, clearing answers and sending votes. A quick 5-minute tutorial followed by some silly questions is a great way to ease confusion and allow you to more smoothly move through your ballots. When setting up your fun Q&A PowerPoint, think about including a sample slide for each of the question types that your audience may see throughout the voting session. For instance, I created a sample PPT presentation that walks participants through the basics of using a Q6 device and I included Multiple Choice, Yes/No and Vote Multiple Mark (vote for more than one), the most commonly used question types for audience voting. Feel free to download and customize the sample PPT for your next event. Download Q6 Tutorial sample. Use a Separate Computer for Intensive Voting Sessions. If you are conducting a large amount of voting, so not just throwing in the quick, occasional polling question for more engagement or discussion, it is best to run the Qwizdom software on a separate machine. In other words, have one laptop for all other media and one dedicated to voting. 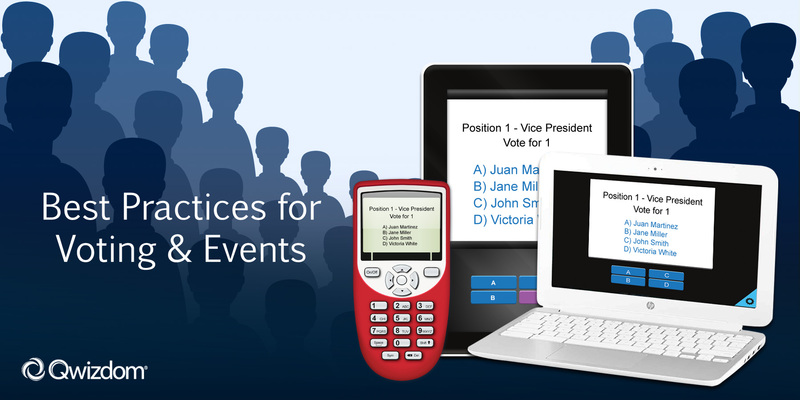 This will allow you to make changes more quickly to the main presentations like adding videos, inserting keynote speaker presentations and more, while providing time to quickly update voting slides for run-off ballots. For clean transitions between computers, use a switcher to go back and forth. Restart Actionpoint Software at Long Breaks. The Qwizdom Audience Response System can run for many hours, but it is always good to close and restart the software if there are long breaks. Closing the software at breaks will not interrupt the flow of your assembly and simply ensures your Qwizdom voting devices will continue to run smoothly. Be sure to start the session 5 minutes prior to reconvening. Add a housekeeping slide that reminds participants to turn on their remotes as they take their seat. Use Learning Games for Learning Summits. If you are running a learning summit and are working with smaller groups such as 100 participants or less, use Fast Track (a car racing game) to quiz your audience. It can help break up lectures and help measure retention rates. Provide the winner with a small door prize. Spark Discussions with Complex Questions. When asking a question, give participants time to think about it before sending their responses. Display the results to begin a class-wide discussion, but avoid quickly showing the correct answer. Compared with the approach of taking one answer from a participant who raised a hand, this gives everyone time to think about an answer, and promotes more discussion and participation. I hope that I have given you some new, fun ideas to try along with some practical hints on improving the flow at your next event. We are happy to assist you with any questions that pop up and remember a free online training session is included with all purchases. You can also hire a Qwizdom Consultant to run Actionpoint software at your event. Contact us, we would love to hear from you. Happy Clicking with Qwizdom!